Yonder Frontiers: You are now leaving WNC. Don’t call us traitors for straying from our beloved natural wonderland. Sometimes you just have to play outside the lines. After all, much of what we love here—lofty peaks, wild rivers, picturesque lakes, and awe-inspiring trails—spills over into Georgia, South Carolina, Tennessee, and Virginia. Summer is the season to grab your gear, whether it be a life jacket, fishing rod, hiking boots, or mountain bike, and head for great escapes just across the border. You are now leaving WNC. Don’t call us traitors for straying from our beloved natural wonderland. There are plenty of reasons the Virginia Creeper Trail is becoming a classic—the great small towns along the way, flexibility of routes, and the option to take the kids. But probably top on that list is the diversity of scenery you’ll view on this ride, which runs 34 miles from Abingdon through the Appalachian Trail town of Damascus, and all the way to the pinnacle of Whitetop Mountain, the state’s second highest peak. From Abingdon to Damascus, the wide, former logging railroad is a rolling ride through pastoral farm country. (Unfortunately, a stretch near mile marker 6 is out of commission due to recent tornadoes, but cleanup has begun and a detour path is expected to open this summer. Check www.vacreepertrail.org for updates.) East of Damascus, the climb to Whitetop runs through breezy evergreen forests and alongside Whitetop Laurel Creek. You can tackle the Creeper in a variety of ways, but the most fun, and downright easiest, approach is to start at the top, high in the Mount Rogers National Recreation Area, and sail down to Damascus. Many businesses in the area rent mountain bikes and ferry riders up to Whitetop Station for the unforgettable 17.4-mile downhill. Even kids eight and older can conquer this three-hour family adventure, which adds to its popularity. So if you prefer smaller crowds, schedule a trip for a weekday. Don’t be in too much of a hurry though. Pause at the top for the view and along the way at two former train stations: Whitetop, an interpretive site with an emphasis on railroad history, and Green Cove, an original depot that still offers refreshments, as it did when it was a general store. Halfway down to Damascus, in the almost hidden village of Taylor Valley, you can grab lunch and delicious chocolate cake at the Creeper Trail Café. For a challenge, make the climb from Damascus up Whitetop and back—a total of 35 miles. While you’re pedaling in a low gear, you might get a feel for why the slow-chugging trains got the “creeper” nickname—independent of the Virginia creeper vine, also called five-leaved ivy, that grows profusely in the area. To go all out, start in Abingdon for the nearly 70-mile round-trip. In which case, you’ll want to plan an overnighter. Historic Abingdon is home to the Martha Washington Hotel & Spa (marthawashingtoninn.com) a highly recommended, upscale base of operations. For a great meal after the long ride, book a table at the inn’s restaurant, Sisters, or The Tavern, which occupies the town’s oldest building, constructed in 1779. Shuttle services will pick you up in Abingdon or run you back to town from any point on the trail, including the Alvarado station, east of the damaged number 7 trestle. Many people stay in Damascus, a hotbed of outdoor enthusiasm. There are plenty of bed-and-breakfasts, including Dancing Bear B&B (dancingbearrentals.com), as well as Mount Rogers Outfitters Hostel (mtrogersoutfitters.com). The Whistle Pig Bistro and Mojoe’s Trailside Coffeehouse will get you fueled up for the adventure, whichever route you set off on. 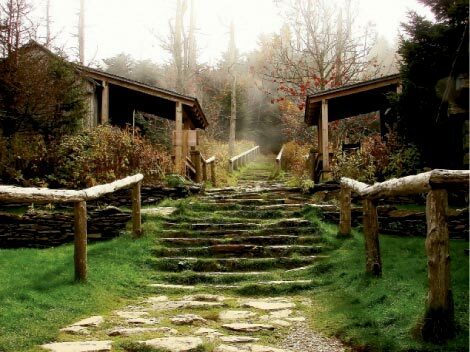 Western North Carolina can claim a longer list of major summits than its neighbor to the west, but Tennesseans, take comfort: Mount LeConte and its lodge make up for it in spades. At almost 6,600 feet, LeConte comes in just 91 feet short of Western North Carolina’s Mount Mitchell, the East’s highest peak. Still, LeConte has more singular distinctions. Lying west of the Smokies’ monumental main ridge, it towers a vertical mile over Gatlinburg, which makes for a dramatic view of civilization far below the powerful presence of wilderness. And the challenging hiking trails are the only way to reach the summit. The cherry on top is LeConte Lodge, which dates to the 1920s, before the Great Smoky Mountains National Park was created. There’s nothing like arriving at a remote, but comfy, hostel offering warm meals and beds to hikers carrying nothing more than daypacks of incidentals. The lodge’s essentials—linens, food, and other supplies—are trekked in by llamas three days a week. It’s such great fun that for many thousands of people, generations in some families, the hike to LeConte Lodge is an annual ritual. How better to track your level of fitness against the march of time than to climb the Smokies’ third highest peak every year and celebrate the achievement in a truly distinctive setting? And it’s quite an achievement. The five possible routes include the Boulevard Trail, an eight-mile masterpiece of a footpath constructed by the Civilian Conservation Corps. The shortest route is Alum Cave Trail at almost six miles and nearly 3,000 feet of rise. The path leads through an arched passageway, under huge cliffs, then continues around abrupt ridges, across talus slopes and rock faces, and up ledges with cables as handholds. At the top, you’ll breathe two sighs of relief; one, when you level off into the breezy cool of LeConte’s spruce forest, and the second when the rustic cabins emerge from the surging fog of passing clouds. There are two main buildings, a central dining room where simple, hearty breakfasts and dinners (wine is available) are served family style, and a recreation space, stocked with games, puzzles, and books to be enjoyed by the fireplace or in a rocking chair on the porch. Scattered around the main structures are seven cabins with porches and three multi-room lodges perfect for groups. All are propane heated and lit by kerosene lamps. The main bathhouse is clean and modern, but no showers are available. The bucket provided in your room permits a hurried bird bath in LeConte’s cold climate, after which you can snuggle under thick wool blankets on the beds. The weather is part of the adventure on LeConte. There’s often snow and ice in spring and fall, and even the height of summer is chilly at this elevation, where the forecast can change quickly. The favorite after-dinner activity is catching the view from nearby Cliff Top or Myrtle Point. After that, all that’s left to do is watch Gatlinburg and Pigeon Forge emerge as gobs of twinkling lights, far below and a world away. An argument could be made that the Chattooga is really a North Carolina river. After all, the nationally designated Wild and Scenic River originates at the base of Whiteside Mountain in Jackson County. Alas, the white water doesn’t get interesting until the Chattooga begins to define the border between Georgia and South Carolina. There, it becomes a class III-IV+ white-water rafting paradise featuring boulder gardens, wave trains, and dramatic waterfalls. The tumultuous water is flanked by Georgia’s Chattahoochee National Forest and South Carolina’s Sumter National Forest, forming the most picturesque white-water experience in the Eastern United States. No roads, no train tracks, no buildings, just you, miles of forested banks, a rubber boat, and one class IV rapid after another. The pristine setting is so treasured, the forest service only allows a few rafting companies to operate trips here, and those voyages are spaced apart so you’re guaranteed not to see another group while on the water. The primitive setting inspired Hollywood to film scenes from Deliverance on the Chattooga, but get the dueling banjo jokes out of your system early and get stoked for a wild ride. The popular Section IV trip is a full-day immersion in “drop and pool” white water, giving you a calm stretch of water after each plunge. The highlight comes at Five Falls, where five class IV waterfalls confront you within a quarter-mile long gorge. If you’re looking for a slightly more mellow excursion that the whole family can get into, sign up for Section III, a 13-mile class III trip upstream from Section IV. The milder white water gets progressively more exciting as you paddle downstream and culminates with Bull Sluice, a Class III+ waterfall that drops 14 feet over two ledges. On both sections, the white water is so demanding, it even manages to keep veteran guides on their toes. “No matter how many times I guide the Chattooga, it’s always a different river,” says Linc Stallings, who’s been leading trips here for 15 years. The Chattooga is free-flowing and dependent on rainfall, which alters the character of the runs from day to day. “At high water, it’s fast, splashy, and fun. At low water, it becomes a really demanding, technical river with bigger drops,” Stallings says. Keep in mind, rafting the Chattooga entails more than just sitting in a rubber boat and enjoying the scenery. You participate, taking orders from your guide to help paddle into the right channels. You swim through underwater caves, jump from two-story high boulders, and hike to waterfalls. It’s not just a rafting trip, it’s a full-bore rafting experience. Children must be eight years old to raft Section III, and 12 or 13 (check with outfitters) for Section IV. Trips last six to seven hours. There’s a part of South Carolina that nudges up against WNC in the comfortable way a daughter might tuck into her father’s resting arm. There, scenic Highway 11 meanders parallel to one of the Blue Ridge Mountain range’s most intriguing rock formations, Table Rock, and its namesake park. The drive from Asheville takes less time than watching one Disney movie—cue the DVD player. This historic and engaging preserve holds all the staple offerings for hikers and campers, including trails aplenty, a small nature center with snake skin displays, and more than 100 campsites between two campgrounds. But it’s also an idyllic destination for day-tripping families in search of a scenic place to paddle a canoe, jump from a high dive, enjoy a bluegrass jam, sun on the beach, fish a mountain pond, or explore historic structures built by Civilian Conservation Corps workers, who also landscaped the park. The old-fashioned swimming hole at Pinnacle Lake fills with hundreds of water lovers who seek out its floating platform, which features low and high dives, and sandy shore during the summer months. Also a favored spot to paddle canoes and kayaks, and tour around in pedal boats, all of which are available to rent, the lake is the center point for most of Table Rock’s buildings and trails. Anglers in search of bass, bream, or catfish should bring a fishing rod and a South Carolina fishing license to cast here or at the larger Lake Oolenoy, which covers 67 acres. The pier is an ideal spot for quickly casting a line with the kids before embarking on a hike. If you don’t bring your own rod and reel, you can rent one at the park’s welcome center. History buffs can enjoy the visible ties to the past. As far as the eye can see, this place is a well-preserved wonderland. That’s partly because about six years ago, volunteers from across the Southeast donated their time and energy to help spruce up the park. During the project, they unearthed the dozens of blue granite steps laid by CCC workers in a serpentine pattern from the old lodge building, through the woods, along the banks of the lake, and ultimately to the boathouse. In the 1930s, the blue granite was taken from local quarries, and was cut, shaped, and placed in the ground by hand. In recent years, the park’s hand-hewn chestnut log-constructed cabins and historic lodge have also been painstakingly restored. Old-time music has a place at Table Rock as well. The Music on the Mountain series is a fun gathering of veteran and young pickers, who amass in the lodge. Chairs are arranged in a circle the second Saturday afternoon of each month so string-wielding musicians can pick and sing. The event attracts some of the best talents from across the region for an authentically Southern bluegrass jam. There are 10 miles of trails to trek within the park, but if you want to feel like king (or queen) of the world, march up Table Rock Trail, a rugged route that places you on top of the granite dome. With more than 3,000 acres to explore, don’t worry if you can’t fit all the activities into one day. All the fun will still be there when you return. Friday & Saturday, 7 a.m.-10 p.m.
Saturday, June 11, 2-6 p.m.
Table Rock State Park serves as a trailhead for the 80-mile Foothills Trail through the Blue Ridge Escarpment wilderness.